Proper storage of a guitar is important for any guitar owner regardless of their level of expertise or usage. Improper storage could spell disaster for a variety of reasons – a reduction of longevity, potential water damage (or other general exposure to the elements), etc. There are a lot of questions that go into this, such as how you should store it, where you should store it, and other factors that we will discuss in this article to hopefully help readers to keep their guitars in the ideal condition. How do you store the guitar? One of the first things that a new guitar owner should get is a guitar case – one that matches the guitar in question, of course – as it protects it from a lot of things. Transportation, the elements, etc. Even if you do not take your guitar out very often, it still will behoove you to keep it in a case when you are not using it. 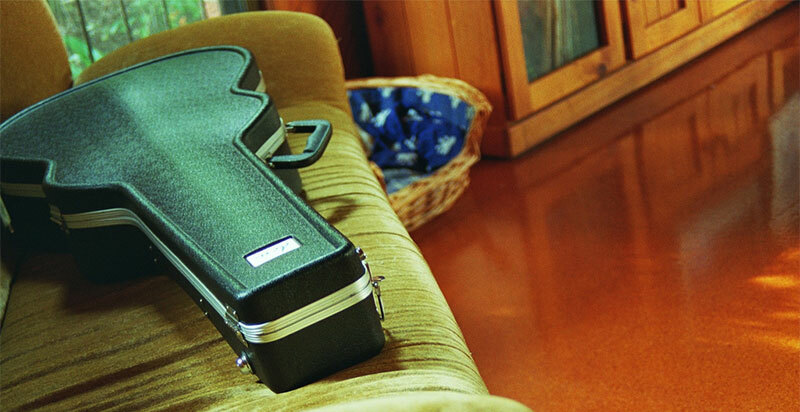 The more time that your guitar is left out of the case, the greater the chance is that the guitar will dull or otherwise become damaged, even when not in use. Dents or scuffs could be made in the guitar’s frame and the strings could become broken or loose. A relatively cheaper guitar case may suffice for your storage needs, but if you want extra protection, it may be better to have something that is more durable, less likely to be forced open by falling, and less likely to allow exposure inside. As such, determining what your price range allows is often going to be the first step a person takes in determining their ideal storage solution. Even if you do get the best storage solution, it is important that you check it for warping or other damage that may occur while in storage. Another option for people who want their guitar to be a little more secure, using a gig bag or a vacuum seal bag could do better for keeping out moisture and other bothersome elements away from your guitar. Where should I store my guitar? Where shouldn’t I store it? Getting the right storage solution for your guitar is a great first step towards keeping your guitar in top-top shape, but it certainly is not the last. In fact, determining exactly WHERE you are going to store your guitar in its case is arguably just as important. If you do not choose an appropriate location to store your guitar, it could ultimately sustain more damage than it could in an appropriate area. For long-term storage, storing your guitar on a rack is not the best of ideas. It is okay if you are only storing it for short periods of time (or are at least making sure to periodically clean and maintain the guitar as needed), but in the long term, this can create unfortunate risk for the quality and longevity of your guitar. You should also make absolutely sure not to store it in areas that are cold or damp, such as a cellar or attic, as this will definitely cause very unfortunate damage. Storing it in a room that is well protected and insulated from dangerous elements is key to keeping the guitar in good shape. Another important approach to guitar storage is a dehumidifer – having one of these near your guitar can do wonders for its long-term health. There are a lot of things that a novice guitar owner should consider when making all of these decisions, and they certainly should not be taken lightly. When making these decisions, think about everything very carefully – think about price, about the storage space you have available, and and other equally important questions. If you value the longevity and quality of your instrument, it is paramount that you take all of the proper precautions to keep it going for a long time.